The blog has been quieter this year. The house hasn't stayed as clean as I'd like. I've not done as much baking. The only reading has been the news and an article here and there. Travel and family visits have taken up a lot of time. The normal day to day has filled the space between all the rest. With both ESL and university classes to teach, along with lesson planning and training and grading, it's been nearly full-time work lately. Plus we're riding bikes again. We've grown friendships by spending more time with people. Life has been busy, but life has been good. Not so long ago, things were very different in my mind. You could have found me at this same table sitting in this same chair feeling unshakably sad, unsure what to do with myself, unsure where to look for guidance. I don't feel that way now, but then again I don't have time to. And maybe that's part of being content. I'm sure some people find contentment when they've got lots of time to ponder the splendor of the universe, the miracle of their souls, their connection with nature. But give me too much time and I quickly stop ascending into clouds of awareness. Stopping long enough to hear the world breathing in and out begins to disturb me. I begin to feel inescapably alone--so alone that whatever happens next, be it a jarring clap of thunder or the electricity of attraction or a moment of what should be pure happiness, I feel nothing. It's hard to come back from nothing. I've done it, so I know. Time, I'm sure, will be my best companion in days of mourning and when he paints difficult days gone by in graceful shades. But he's no friend of mine if I've got no distraction from him day after day. Being busy is good for me. Sure, work gets stressful. I can't get everything done. I get dark circles under my eyes and fall into bed exhausted night after night. But a healthy me is an active me--active doing something I love doing. That was the other part of the problem when you would have found me sulking in this chair--I was chasing the wrong kind of dream. In TJ Maxx recently, my main goal for the day was retail therapy. After too many days in a row working to exhaustion, browsing the aisles in a discount store or in Target, looking for some silly little treasure to warm up a chilly corner of the house is relaxing. So I was at TJ Maxx in the checkout line and came across this mug. I love a good quote. A good one sums up something big so it's small enough to hold, literally in this case. 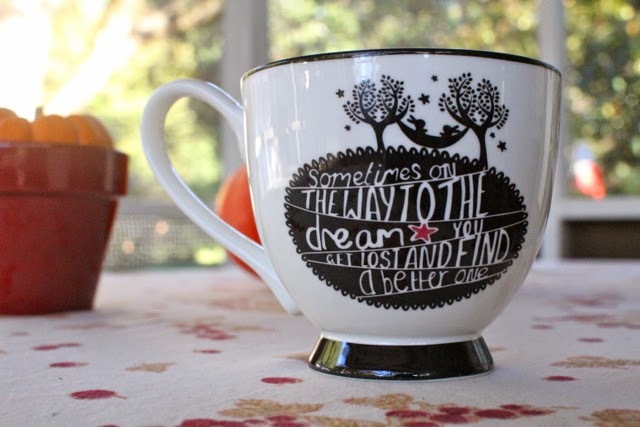 The mug says: "Sometimes on the way to the dream, you get lost and find a better one." That hit me like a good quote should. I thought, "Yes. Yes. That's been me." 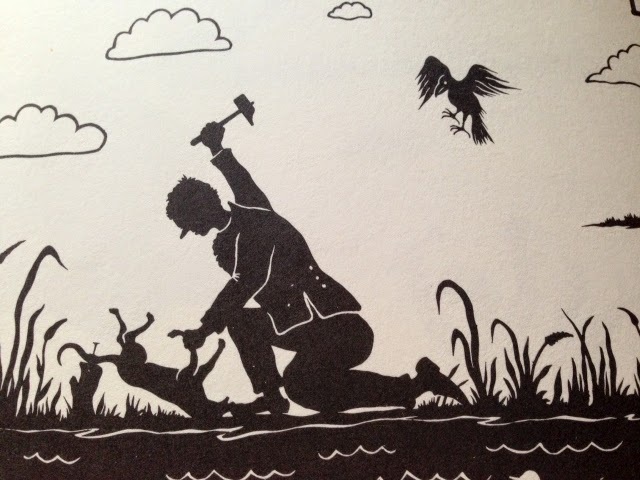 If you've read this blog before, you'll know I've struggled with the dream of becoming a successful (oh who am I kidding: famous) writer of children's stories. It all started when I graduated college and wondered what to do next. 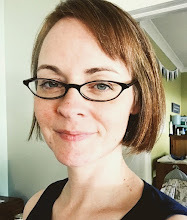 After a year of wondering, I started an MFA in children's literature because I loved kids' books and thought I might have the knack for writing. 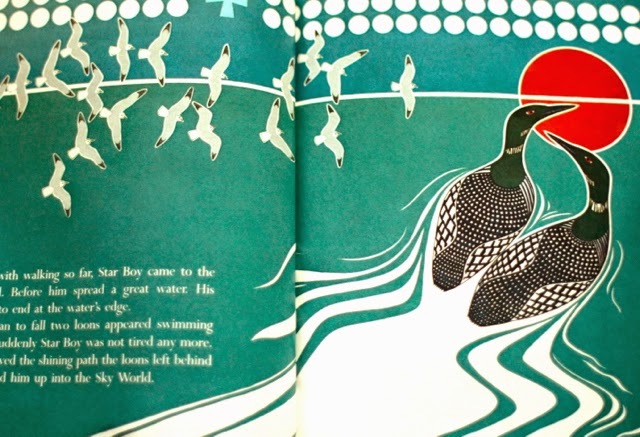 That led to a winding road that ended with me not loving children's books in the same pure way I had before (for enjoyment alone) and with a surprisingly competitive urge to be the one who "made it." The degree got me a university job teaching something I wasn't terribly interested in (academic writing and grammar), but I 'd expected that. After all, it takes a while to make a living at writing. So I taught and waited to get famous. Long story short, I didn't. Get famous, I mean. I'm not saying it couldn't still happen. But the curious thing is that while I was off teaching all those hours and writing on the side, something shifted so that I can tell you now, after three years, with complete honesty and no trace of the competitive, almost frantic urge that led me to write before: I don't give a crap if I ever get published. I love writing. I mean you're reading my writing right now, after all, so obviously it's still important to me. And children's books are the best kind of books in the world, hands down, don't even try to argue with me about it. And it would be really fun to someday have a bigger audience and sign a book for someone. But the old fire is out, and along the way, a new one started. My dream turned out to be something I stumbled upon while I was waiting to get famous: teaching. Teaching isn't a "better" dream than writing. In fact, it's very similar. Words send messages, whether spoken or written. Heck, I'm paid to have captive audiences listen to me tell stories. At the end of my Creative Writing class last term, I dismissed the students to go home and ended up in tears when they said, "Tell us one last story, Ms. Robin." I am, in my little world, a famous storyteller. I know my listeners so well, the stories are tailored to them. I'm given a small part of their lives to affect with my words. And sometimes, according to them, the affect is real. Wallowing in failed stories at home and beating myself up for not being good enough at what is essentially a lottery (the publishing world)...I'm not built for that. But teaching? Oh, man. Like a glove. If someday I get published, it'll be icing on a cake that's got a hell of a lot of icing on it already. But I'm not actively pursuing that dream anymore. Because in the end, I'm a stage performer. I'm an entertainer. A storyteller. I want an audience. And I like to help people. Teaching lets me be and do all of that. The result is there's no time needed for wondering what I should do next or questioning my place in the universe. There's no time to feel lonely. There's nothing unsure. And most importantly, there's no, "When (fill in the blank) happens, then I'll be happy." You've got access to the internet. That means you can get children's books from various cultures and in various languages online anytime you like. Simple. What isn't simple in most of the United States is finding a place to browse diverse titles in person. Even independent bookstores can't afford to keep a varied inventory. But don't lose hope. If you want a culturally diverse personal library and you like flipping through the books first, I've got a suggestion: travel to Atlanta, New York, Miami, DC, Los Angeles, San Francisco, border states, state capitals--wherever there are diverse, urban populations. When you get there, don't bother with McBookstores or even independent ones. Instead, go to thrift shops, Goodwills, Salvation Armies, yard sales, festivals, and open markets. That's where I found the following. I'm lucky to live in an urban area. Here, diversity is the norm, refugee populations abound, and, unlike much of the United States and much of my life, I have the experience of living in a place where white people are one of many large groups that make up this city life, not the majority. Our neighborhood sits between a large Korean community and a large Hispanic community. Mixed in are lots of other people who don't check any of those boxes on the census and who come from all over the world. This is an excellent situation for many reasons, one of which is the abundance of children's books I've never heard of and plenty I can't read (due to not speaking the language) showing up on thrift shop shelves all over town. This week, I found six books for the expansion of culture and knowledge, and they were all under $2 each. I got some at a local fall festival and some at a local thrift shop. I'll introduce three here and mention the other three at the end of the post. 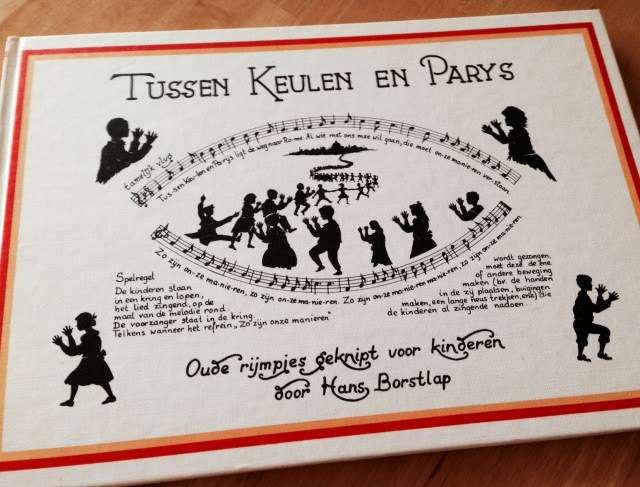 The first is Tussen Keulen en Parys (Between Cologne and Paris), by Hans Borstlap. The text is in Dutch (note: though there seem to be some Afrikaans spelling influences, such as the y in Parys instead of Parijs, the articles de and het are used throughout, so I'm going with Dutch--unfortunately I don't speak either and can't find much information on the book, so please inform me in the comments if I'm incorrect here!). 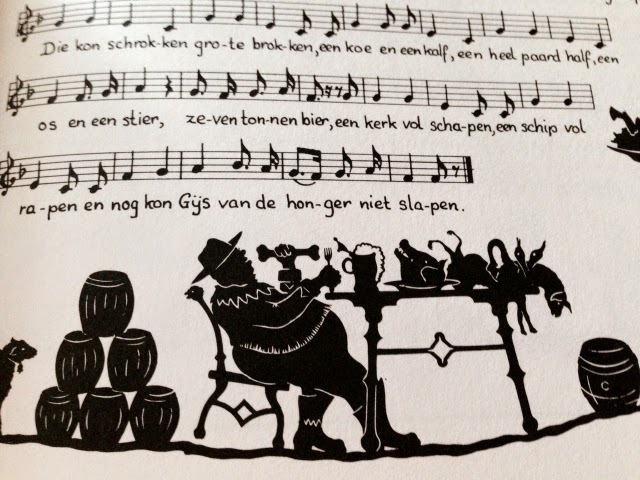 The book is made up of simple sheet music to go along with rhyming songs and beautiful woodcut-style illustrations that depict fascinating scenes I can't make out without putting the text through a translator. There seem to be short verses of poetry mixed in, and lobbes bookseller says there are instructions for games included as well, such as the game that goes along with the song the book is titled after. During the game, (I think) children are to stand in a circle around one child who is the leader. They all sing the song, and when they get to the chorus, the leader is to pull a funny face or position, and the rest must copy him/her. Fun! Here are some pictures of the book. 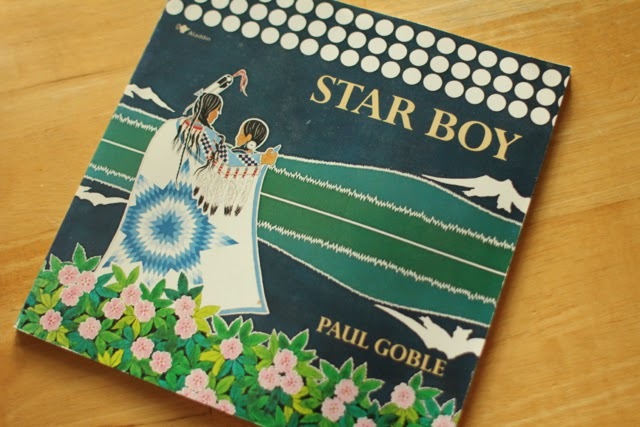 Another of the books, Star Boy, by Paul Goble, is, according to the copyright page, "the story of how the sacred knowledge of the Sun Dance was given to the Blackfoot people." It goes on to explain that the illustrations have incorporated sacred Blackfoot symbols and explains what those symbols mean. The story tells of a girl who married Morning Star, went to live in the Sky World and was punished for disobeying the Sun. 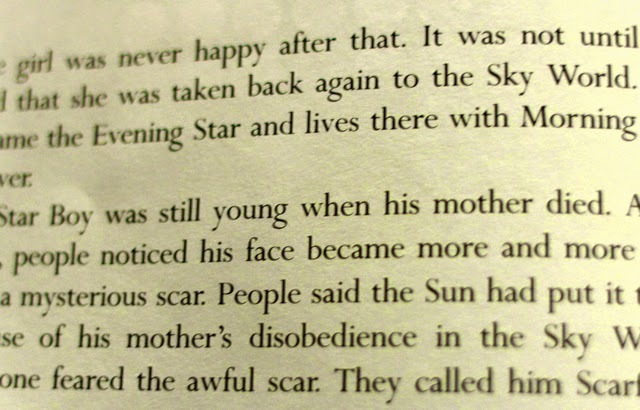 As her punishment, the Sun gives her child a scar and sends them both back to earth. One day when her child grows up and falls in love, he must try to find the Sun to ask for his blessing over the marriage and, as a sign of the blessing, for his scar to be removed. If you want to know how it ends, you'll have to buy the book yourself! 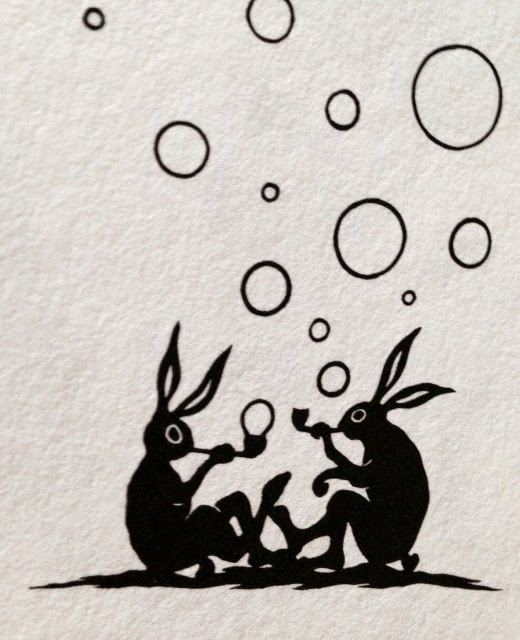 Here's a taste of the beautiful illustrations. 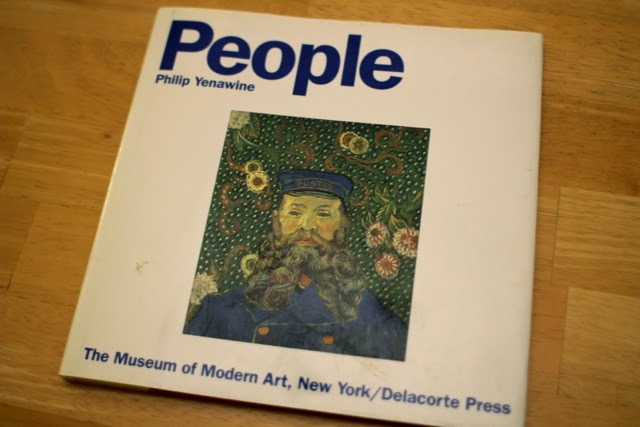 The third book, People, is by Philip Yenawine, a man who helped found a nonprofit that teaches "visual literacy" and communication through art. 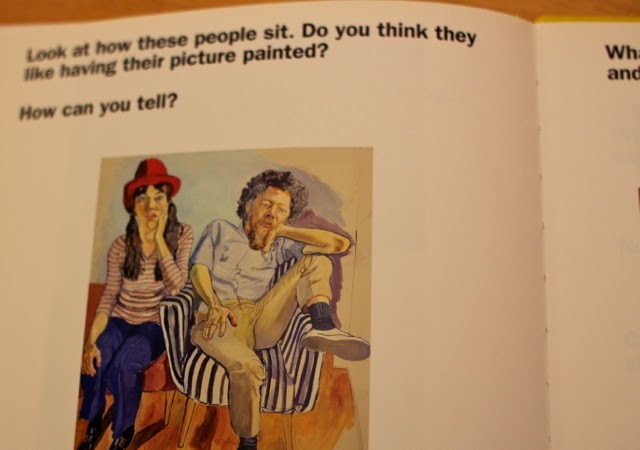 It's a book of pictures from The Museum of Modern Art in New York. 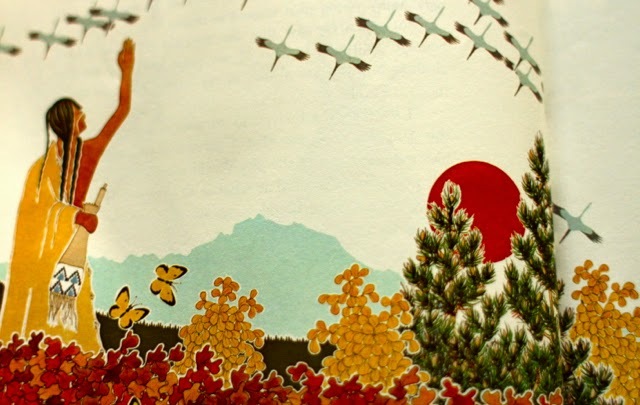 Above or beside each picture are questions about the image that encourage the reader to look more closely at what they're seeing. 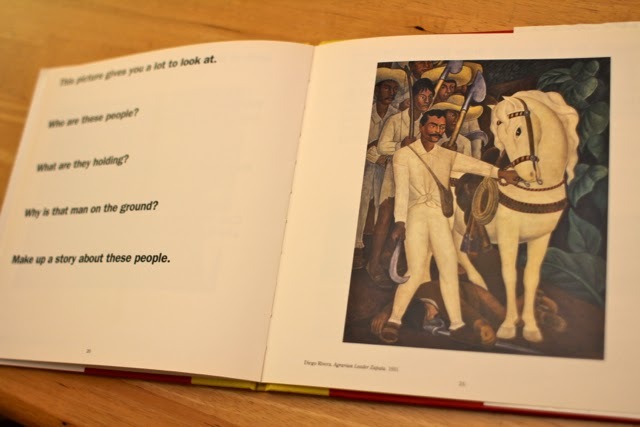 The book describes itself as one that hopes to teach children "to enjoy art and think creatively." Their stance on showing art to children--"you can help them develop their innate capacities for careful observation and creative imagination"--makes a lot more sense than the ideas in this recent article. There's a growing fear that observation and imagination are being lost, especially amongst the young generations. That's why this book seems a worthy one to have in any home library. Here are a few pictures to whet your appetite. 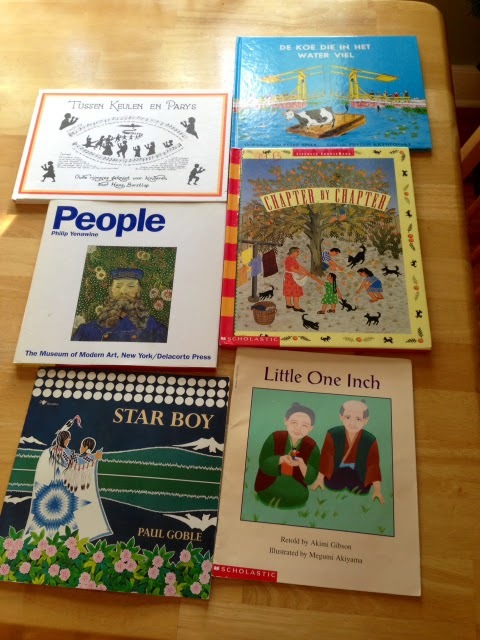 As promised, the other three: Little One Inch, a retold Japanese folktale akin to Tom Thumb, Chapter by Chapter, a surprising school textbook from the mid 90s, and another book in Dutch, De Koe die in Het Water Viel, with art by Caldecott winning illustrator, Peter Spier. Go discover why they're just as interesting as the ones described above. Or go find something else unlike anything you've read before. Even if you have to translate every word.